UPDATED, Feb, 24, 2010 — Orlando Zapata died Feb. 23, 2010, after more than 80 days on hunger strike. UPDATED, March 20, 2010 — Juan Rivera had six months added to his sentence. UPDATED, March 16, 2011 — The Catholic Church announced March 16, 2011, that Rivera — or Rivero — would be released and take exile in Spain. Cuban dissidents Juan Ramón Rivera Despaine and Orlando Zapata Tamayo are cut from the same cloth. Together, they co-founded in 2002 the Alternative Republican Party, and behind the bars of the Castro gulag, they have kept up the fight, despite the grave threats to their lives. Zapata has been on hunger strike since Dec. 3, demanding his captors respect his human rights. He is lying in a Camagüey hospital, dying from the effects of his protest, and as his mother reminded us last week, most in the world don't give a damn. That will never be the case here, which is why he again is being honored here as a Political Prisoner of the Week. Like Zapata, Rivera has sacrificed himself to protest his maltreatment by the Castro dictatorship. Rivera last year was sentenced to 2 years in a labor camp on a charge of "assault," after police arrested him in June for selling a few tomatoes from his home. Evidently, the two years he had earlier served in prison after being found to be a "pre-criminal social danger," did not work! When he started a hunger strike because he couldn't get medical attention after he found blood in his urine, officials last fall transferred Rivera to the Aguadores prison in Santiago de Cuba. From there, he called on the international community to come to his aid. Last month he was transferred to the maximum Mar Verde prison, also in Santiago, after authorities opened a new "assault" case against him, according to a report posted at Payo Libre. 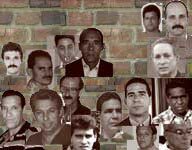 The suffering by Rivera, Zapata and hundreds, if not thousands, of other political prisoners reminds us that the fight for Cuban liberty is taking place not just on the streets or on the Internet, but in the darkest holes of the gulag. To read a the previous profile of Zapata, go here. For a fantastic profile of Zapata and his mother, en español, read this.